U.S. unemployment fell to 4.7%, the lowest rate since 2007. But job creation was very weak. The U.S. economy only added 38,000 jobs in May, according to the Labor Department. It was the worst monthly job gain since 2010. It's also well below April's meager job gains of 123,000. Job creation in the last two months has been markedly below the average of 200,000 jobs created per month over the past couple years. The drop in unemployment came as more disheartened Americans stopped looking for jobs and dropped out of the labor force in May. 'It's a pretty gloomy report, hard to find a silver lining in this one," says Curt Long, chief economist at the National Association of Federal Credit Unions. Why were job gains so low: About 36,000 Verizon employees didn't report to their jobs to participate a strike for 6 weeks. That brought down the numbers. 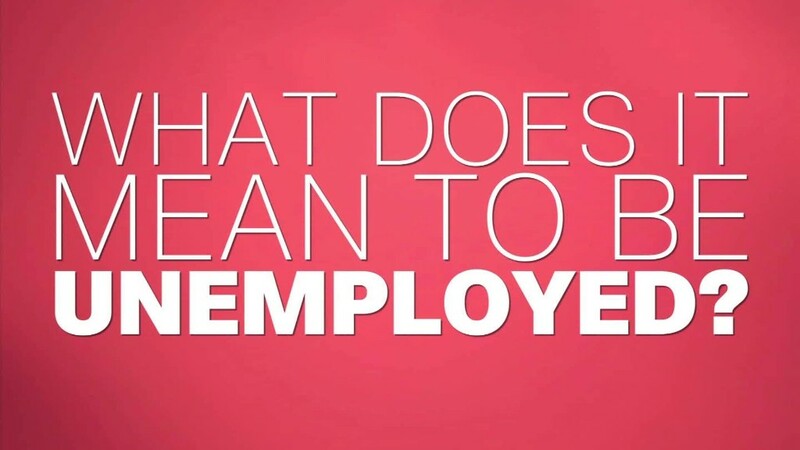 Another key factor -- the U.S. economy is considered to be at or near "full employment" and it's expected that hiring will slow down to a certain degree. Why did unemployment rate drop: Not for good reasons. More Americans stopped looking for work and fell out of the workforce. That means they aren't counted in the labor force and that brings down the jobless rate. In recent months, more Americans had been coming back into the job market. Now the trend appears to be hitting a plateau. Who's hiring, who's not? Health care, hotels and the government added jobs in May. But 15,000 construction jobs were lost, while 10,000 jobs disappeared in manufacturing. 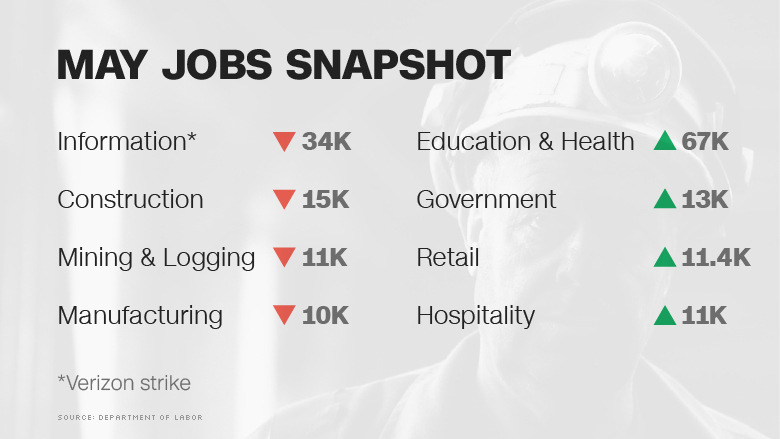 Mining, or oil and gas jobs, fell by 10,000 in May. Hiring peaked for the industry in 2014, after which oil prices crashed. Since then, mining has lost 207,000 jobs. There were more warning signs. Job growth in March and April was revised down by a cumulative 59,000 jobs. Job gains have declined for three straight months now. The number of Americans working part-time jobs but want full-time jobs shot up to 6.4 million from about 6 million. These so-called "involuntary" part-time workers have remained a major concern in the job market. Before the recession there were only about 4.2 million such part-timers. Perhaps the only slightly upbeat sign was wage growth, which continued to show signs of life in May, albeit at a slow pace historically. Wages grew 2.5% in May. The Fed wants to see wage growth around 3.5%. "Some new workers are seeing higher wages, but there hasn't been a significant acceleration in wage pressure," says Ryan Wang, U.S. economist at HSBC. Many experts, including Federal Reserve Chair Janet Yellen, view America's job market at or near "full employment." Indeed, the unemployment rate is a lot lower than the 10% rate it hit in October 2009 right after the recession. Friday's jobs report is a key factor for Yellen and her Fed colleagues heading into their two-day meeting in two weeks. Fed officials have hinted in recent weeks that they may raise interest rates in June after a slew of positive economic data prior to the jobs report. The weak May jobs report may very well take a June rate hike off the table for the Fed. Wall Street expectations for a June rate hike plummeted immediately after jobs report. Now investors only believe there's a 4% chance of a rate hike in June. Yellen, the Fed leader, has a speech on the economy planned for Monday. She may need to tweak it now, some say. "That sound you hear is Fed Chair Janet Yellen furiously re-writing her speech," says Paul Ashworth, chief U.S. economist at Capital Economics, a research firm. "The weakness in May's payrolls was widespread."